This from a president who promised new efficiencies in government. You wouldn’t know it, based on the endless cries for more money coming from the military, politicians, and the president, but these are the best of times for the Pentagon. Spending on the Department of Defense alone is already well in excess of half a trillion dollars a year and counting. Adjusted for inflation, that means it’s higher than at the height of President Ronald Reagan’s massive buildup of the 1980s and is now nearing the post–World War II funding peak. And yet that’s barely half the story. There are hundreds of billions of dollars in “defense” spending that aren’t even counted in the Pentagon budget. Under the circumstances, laying all this out in grisly detail—and believe me, when you dive into the figures, they couldn’t be grislier—is the only way to offer a better sense of the true costs of our wars past, present, and future, and of the funding that is the lifeblood of the national-security state. When you do that, you end up with no less than 10 categories of national-security spending (only one of which is the Pentagon budget). So steel yourself for a tour of our nation’s trillion-dollar-plus “national security” budget. Given the Pentagon’s penchant for wasting money and our government’s record of engaging in dangerously misguided wars without end, it’s clear that a large portion of this massive investment of taxpayer dollars isn’t making anyone any safer. The Pentagon’s “base” or regular budget contains the costs of the peacetime training, arming, and operation of the US military and of the massive civilian workforce that supports it—and if waste is your Eden, then you’re in paradise. The department’s budget is awash in waste, as you might expect from the only major federal agency that has never passed an audit. For example, last year a report by the Defense Business Board, a Pentagon advisory panel, found that the Department of Defense could save $125 billion over five years just by trimming excess bureaucracy. And a new study by the Pentagon’s Inspector General indicates that the department has ignored hundreds of recommendations that could have saved it more than $33.6 billion. The Pentagon can’t even get an accurate count of the number of private contractors it employs, but the figure is certainly in the range of 600,000 or higher, and many of them carry out tasks that might far better be handled by government employees. Cutting that enormous contractor work force by just 15 percent, only a start when it comes to eliminating the unnecessary duplication involved in hiring government employees and private contractors to do the same work, would save an easy $20 billion annually. And the items mentioned so far are only the most obvious examples of misguided expenditures at the Department of Defense. Even larger savings could be realized by scaling back the Pentagon’s global ambitions, which have caused nothing but trouble in the last decade and a half as the US military has waged devastating and counterproductive wars in Iraq, Afghanistan, Syria, and elsewhere across the Greater Middle East and Africa. 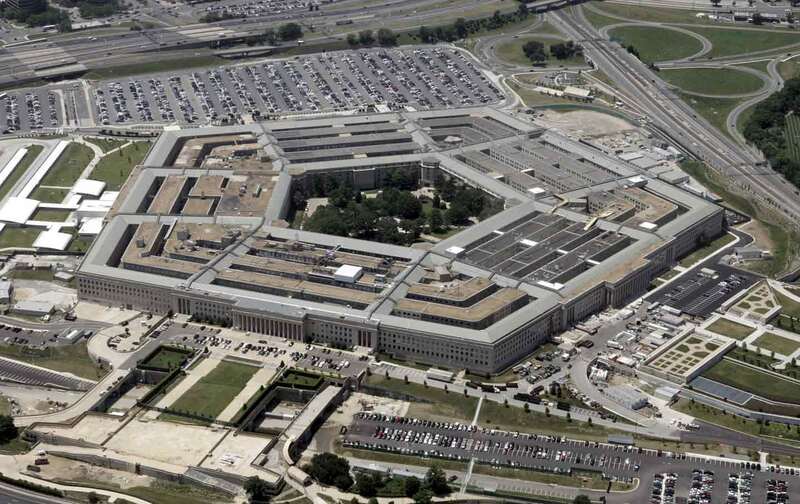 An analysis by Ben Friedman of the conservative Cato Institute estimates that the Pentagon could reduce its projected spending by one trillion dollars over the next decade if Washington reined in its interventionary instincts and focused only on America’s core interests. Donald Trump, of course, ran for president as a businessman who would clean house and institute unprecedented efficiencies in government. Instead, on entering the Oval Office, he’s done a superb job of ignoring chronic problems at the Pentagon, proposing instead to give that department a hefty raise: $575 billion next year. And yet his expansive military funding plans look relatively mild compared to the desires of the gung-ho members of the armed services committees in the House and Senate. Democrats and Republicans alike want to hike the Pentagon budget to at least $600 billion or more. The legislative fight over a final number will play out over the rest of this year. For now, let’s just use Trump’s number as a placeholder. The wars of this century, from Iraq to Afghanistan and beyond, have largely been paid for through a special account that lies outside the regular Pentagon budget. This war budget—known in the antiseptic language of the Pentagon as the “Overseas Contingency Operations” account, or OCO—peaked at more than $180 billion at the height of the Bush administration’s intervention in Iraq. As troop numbers in that country and Afghanistan have plummeted from hundreds of thousands to about 15,000, the war budget, miraculously enough, hasn’t fallen at anywhere near the same pace. That’s because it’s not even subject to the modest caps on the Pentagon’s regular budget imposed by Congress back in 2011, as part of a deal to keep the government open. In reality, over the past five years, the war budget has become a slush fund that pays for tens of billions of dollars in Pentagon expenses that have nothing to do with fighting wars. The Trump administration wants $64.6 billion for that boondoggle budget in fiscal year 2018. Some in Congress would like to hike it another $10 billion. For consistency, we’ll again use the Trump number as a baseline. You might think that the most powerful weapons in the US arsenal—nuclear warheads—would be paid for out of the Pentagon budget. And you would, of course, be wrong. The cost of researching, developing, maintaining, and “modernizing” the American arsenal of 6,800 nuclear warheads falls to an obscure agency located inside the Department of Energy, the National Nuclear Security Administration, or NNSA. It also works on naval nuclear reactors, pays for the environmental cleanup of nuclear weapons facilities, and funds the nation’s three nuclear weapons laboratories, at a total annual cost of more than $20 billion per year. This catchall category encompasses a number of flows of defense-related funding that go to agencies other than the Pentagon. It totals about $8 billion per year. In recent years, about two-thirds of this money has gone to pay for the homeland security activities of the FBI, accounting for more than half of that agency’s annual budget. The four categories above make up what the White House budget office considers total spending on “national defense.” But I’m sure you won’t be shocked to learn that their cumulative $677.6 billion represents far from the full story. So let’s keep right on going. After the 9/11 attacks, Congress created a mega-agency, the Department of Homeland Security (DHS). It absorbed 22 then-existing entities, all involved in internal security and border protection, creating the sprawling cabinet department that now has 240,000 employees. For those of you keeping score at home, the agencies and other entities currently under the umbrella of DHS include the Coast Guard, the Federal Emergency Management Agency, the Federal Law Enforcement Training Center, the Domestic Nuclear Detection Office, United States Citizenship and Immigration Services, the US Customs and Border Protection Agency, the Transportation Security Agency, the US Secret Service, the Immigration and Customs Enforcement Agency (ICE), and the Office of Intelligence Analysis (the only one of America’s 17 intelligence agencies to fit under the department’s rubric). How many of these agencies actually make us safer? That would be a debatable topic, if anyone were actually interested in such a debate. ICE—America’s deportation force—has, for instance, done far more to cause suffering than to protect us from criminals or terrorists. On the other hand, it’s reassuring to know that there is an office charged with determining whether there is a nuclear weapon or radioactive “dirty bomb” in our midst. While it’s hard to outdo the Pentagon, DHS has its own record of dubious expenditures on items large and small. They range from $1,000 fees for employees to attend conferences at spas to the purchase of bagpipes for border protection personnel to the payment of scores of remarkably fat salaries to agency bureaucrats. On the occasion of its 10th anniversary in 2013, Congressman Jeff Duncan (R-SC) excoriated the department as “rife with waste,” among other things, pointing to a report by the DHS inspector general that it had misspent over $1 billion. DHS was supposed to provide a better focus for efforts to protect the United States from internal threats. Its biggest problem, though, may be that it has become a magnet for increased funding for haphazard, misplaced, and often simply dangerous initiatives. These would, for instance, include its program to supply grants to local law enforcement agencies to help them buy military-grade equipment to be deployed not against terrorists, but against citizens protesting the injustices perpetrated by the very same agencies being armed by DHS. The Trump administration has proposed spending $50 billion on DHS in FY 2018. US government-run military aid programs have proliferated rapidly in this century. The United States now has scores of arms and training programs serving more than 140 countries. They cost more than $18 billion per year, with about 40 percent of that total located in the State Department’s budget. While the Pentagon’s share has already been accounted for, the $7 billion at State—which can ill afford to pay for such programs with the Trump administration seeking to gut the rest of its budget—has not. The United States government has 16 separate intelligence agencies: the Central Intelligence Agency (CIA); the National Security Agency (NSA); the Defense Intelligence Agency; the FBI; the State Department Bureau of Intelligence and Research; the Department of Homeland Security Office of Intelligence Analysis; the Drug Enforcement Administration Office of National Security Intelligence; the Treasury Department Office of Intelligence and Analysis; the Department of Energy Office of Intelligence and Counterintelligence; the National Reconnaissance Office; the National Geospatial Intelligence Agency; Air Force Intelligence, Surveillance, and Reconnaissance; Army Military Intelligence; the Office of Naval Intelligence; Marine Corps Intelligence; and Coast Guard Intelligence. Add to these the Office of the Director of National Intelligence (ODNI), which is supposed to coordinate this far-flung intelligence network, and you have a grand total of 17 agencies. The United States will spend more than $70 billion on intelligence this year, spread across all these agencies. The bulk of this funding is contained in the Pentagon budget—including the budgets of the CIA and the NSA (believed to be hidden under obscure line items there). At most, a few billion dollars in additional expenditures on intelligence fall outside the Pentagon budget and since, given the secrecy involved, that figure can’t be determined, let’s not add anything further to our running tally. A steady uptick of veterans generated by the wars in Iraq and Afghanistan has dramatically increased the costs of supporting such vets once they come home, including the war wounded, some of whom will need medical care for life. For 2018, the Veterans Administration has requested over $186 billion for its budget, more than three times what it was before the 2001 intervention in Afghanistan. The trust fund set up to cover pensions for military retirees and their survivors doesn’t have enough money to pay out all the benefits promised to these individuals. As a result, it is supplemented annually by an appropriation from the general revenues of the government. That supplement has by now reached roughly $80 billion per year. It’s no secret that the US government regularly runs at a deficit and that the total national debt is growing. It may be more surprising to learn that the interest on that debt runs at roughly $500 billion per year. The Project on Government Oversight calculates the share of the interest on that debt generated by defense-related programs at more than $100 billion annually. That final annual tally of nearly $1.1 trillion to pay for past wars, fund current wars, and prepare for possible future conflicts is roughly double the already staggering $575 billion the Trump administration has proposed as the Pentagon’s regular budget for 2018. Most taxpayers have no idea that more than a trillion dollars a year is going to what’s still called “defense,” but these days might equally be called national insecurity. So the next time you hear the president, the secretary of defense, the chairman of the Joint Chiefs of Staff, or a hawkish lawmaker claim that the US military is practically collapsing from a lack of funding, don’t believe it for a second. Donald Trump may finally have put plutocracy in the Oval Office, but a militarized version of it has long been ensconced in the Pentagon and the rest of the national-security state. In government terms, make no mistake about it, the Pentagon & Co. are the 1 percent.